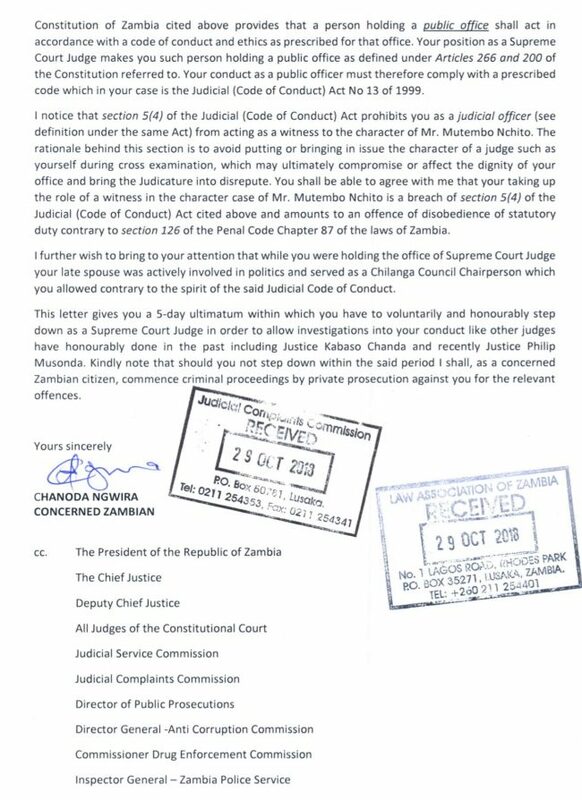 Patriotic Front Cadre Chanoda Ngwira has written to Supreme Court Judges Mumba Mailila and Albert Wood to resign following their witness statements in Mutembo Nchito’s case against his dismissal as Director of Public Prosecution. 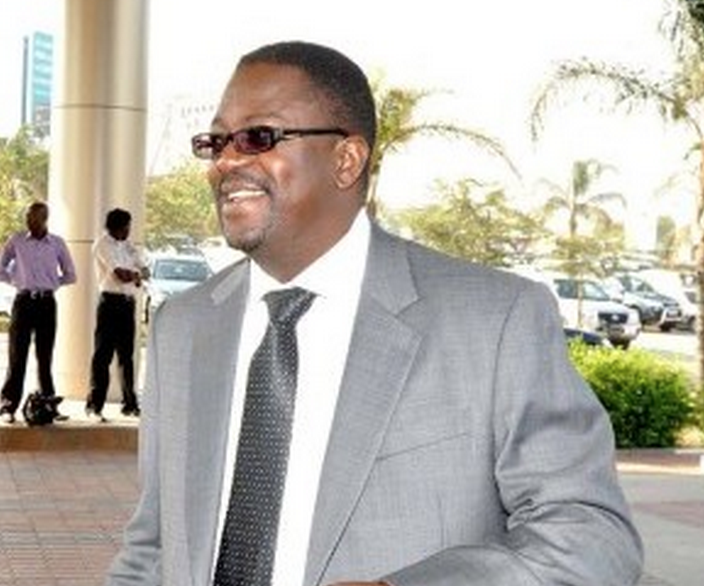 Ngwira has given the two Judges a five day ultimatum failure to which he would commence private prosecution. This is in the case that Mutembo has challenged his dismissal by President Edgar Lungu in the Constitutional Court. In his witness statement Justice Malila stated that although one of the terms of reference for the tribunal that investigated Mutembo and recommended his removal as DPP included an allegation that he entered a nolle prosequi in the case of the People v Dr. Rajan L. Mahtani , no one consulted him before the tribunal was constituted. He said he was surprised that Mutembo was arrested as a result of a nolle prosequi which he entered in Dr. Mathani ‘s vase when it was him as Attorney General then, who directed him to do so. “Mr. 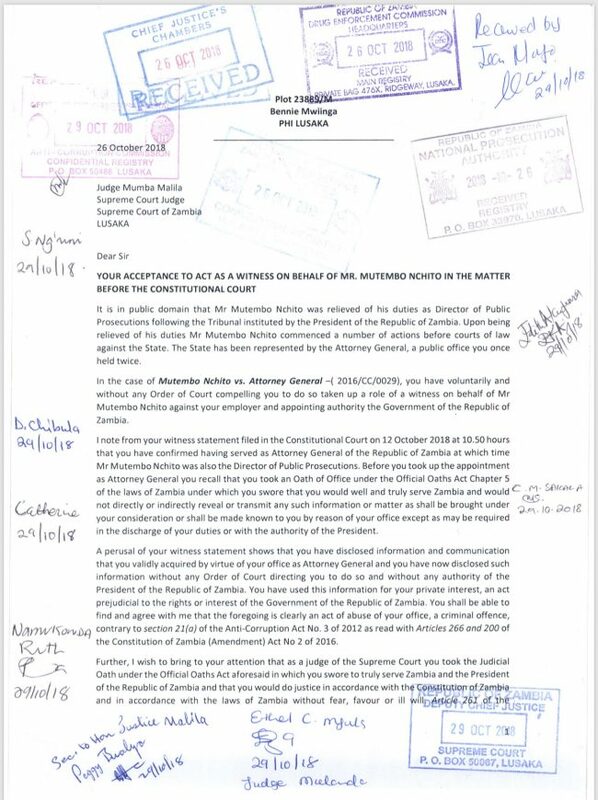 M. Nchito SC had referred the matter involving The People v Dr. R.L Mathani and Mr. John Sangwa and sought guidance on how to proceed because he could not deal with it himself and it raised an issue involving public policy,” Justice Malila stated.